Holy smokies. Has it really been 10 years? Has a decade passed since I started writing this blog? I'll set some thoughts to pixels about the past 10 years, but not today. Yes, I've got something up my flour-dusted and sauce-splattered sleeve--but I need to get a wiggle on to get it sorted. The past week has been filled with happy things: apart from Cardamom Addict's anniversary, I've also marked my birthday (really, every year is a significant year) and celebrated as my dear friend exchanged "I dos" with his beloved. It's always a special thing when two people who are totally and utterly in love make a commitment to one another. They are both kind and giving souls and I wish them all the happiness in the world. For three days we fested in a bucolic setting, complete with bright blue skies, a babbling waterfall, green fields, shady trees, storybook black and white Bessies keeping the grass at bay, and a horse who occasionally marked his glee by waggling on his back in his paddock. As with many such events, not everyone who should attend, can attend. Tucked into a display of photographs of family who have passed away, but not passed in memory, was a photograph of a familiar face with twinkly eyes. You see, my friend who was getting married, was the same person who introduced me to our dear Edna Staebler. While he was not born into Edna's family, he became one of hers. Edna was a local treasure, literary trailblazer and the woman who introduced the world to the Mennonite cookery of our area, Waterloo County. Regular readers know I've written about her before. In fact, today is the ninth anniversary of Edna's passing. In honour of Edna, and what she meant to my friend, her recipes were curated by Rose Murray into the weekend's menus: Good As Gold Soup; Ol’ Walper Hotel’s Spinat Salad coquette on German Red Cabbage with Apples & Bacon; Herb & Peppercorn Sirloin with Red Wine Demiglace; Roast Pork with German Mustard, Pepper & Rosemary, with an Apple-Cranberry-Sweet Onion Chutney, Mixed Veg; Loaded Mashed Potatoes, and (of course) the sweets--pies, cookies, butter tarts, and sticky buns. I could not think of a more perfect edible collection for this celebration. While I hemmed and hawed about my tenth anniversary post and what would busy my kitchen, I took inspiration from these celebrations and decided to make Edna's sticky buns from her second cookery book, More Food That Really Schmecks. And really, how better to recognize Cardamom Addict's milestone than by recognizing a lovely and amazing local home cook--one without airs or pretension--who loved to write? 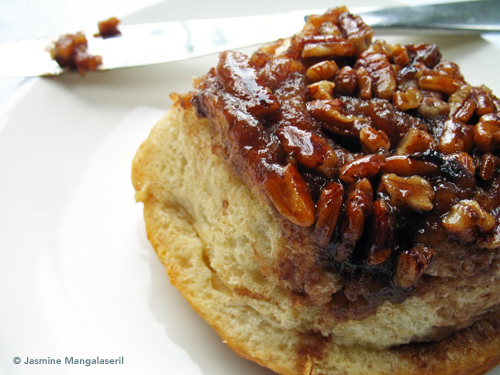 Edna's sticky buns are made from "Mary Ann Martin's Magic Buns, Doughnuts, and Rolls." We all need a mother recipe that's easily adaptable--and this one is. 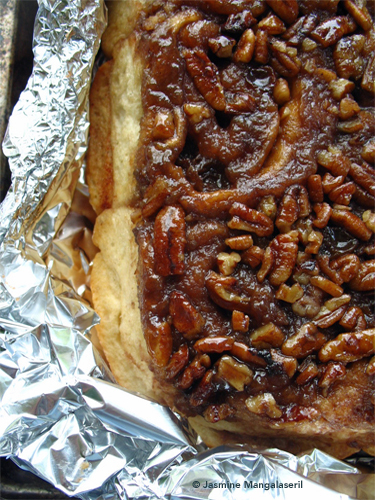 Apart from sticky buns, instructions are given for cream buns, Chelsea buns, long johns, and honey-glazed doughnuts. The original mother recipe calls for more than 1kg of flour. To make the sticky buns, we are instructed, as any good home baker would, to follow as you would for the Chelsea buns, but use maple syrup and cream instead of butter, sugar and raisins at the bottom of the pan. How much dough to use for the Chelsea buns (and hence the sticky buns)? A piece, of course. Start with the dough by blooming the yeast in 50ml hand-hot water, mixed with a quarter-teaspoon sugar. A frothy head should appear after 10 minutes. While the yeast is frothing, turn on the hob to melt the lard, sugar and salt in the water--even using frozen lard, it doesn't take more than five minutes. Cool the water to not much above a lukewarm temperature. Temper the egg with this sugar-water solution, mixing well before adding the egg to the pot. Whisk in the yeast. Create a soft--if slightly sticky--dough by mixing in several heaping spoonfuls of flour at a time--the amount of flour you'll need will be dependent upon your kitchen's mood. When the dough is of a good consistency, give it a light knead before plopping it into an oiled bowl. Set the bowl in a warm, draft-free space until the dough doubles in volume (about one hour). While the dough is rising, butter the baking dish. Make the syrup by melting the butter into the maple syrup. Give it a good stir and pour into the bottom of the prepared baking dish. Tilt the dish so the bottom is fully coated with the buttery maple syrup. Strew nuts on top and give it a light sprinkling of salt. When the dough is ready, punch it down and roll it out to about a 1.25cm (0.5") thick rectangle. Slather generously with the melted butter and sprinkle with a few handfuls (or more, or less), of brown sugar. Lightly dust with cinnamon. Strew sultanas before tightly rolling the sheet as you would a jelly roll. Pinch the edge to the log to form a seam. Cut the log into even 3cm-4cm (1"-1.5") stumps and place cut-side down into the prepared pan. Brush the exposed bottoms with any remaining melted butter (or melt some more), cover the dish with cling film and prove the buns until they double in volume (again, about an hour). Preheat oven to 190C/375F and bake, uncovered, for about 20-25 minutes or until your kitchen is scented with baking and the buns are golden. Remove from the oven and immediately place large baking sheet over the baking dish. Grasp the blisteringly hot dish and baking sheet together (using oven mitts, of course) and turn the buns over, releasing buns and topping onto sheet, so that the nuts and and sticky sauce are now on top. Let cool five minutes before serving. Serve warm. If you don't use lard, use the same quantity of shortening--the original recipe called for either fat. 1tsp cinnamon -- Perhaps less. Perhaps more. I also used a light sprinkling of both black pepper and hot chilli pepper in the filling--I like it, and I think Edna wouldn't mind.